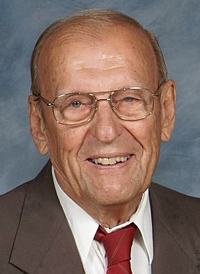 Deacon Joseph R. Upcavage, 87, died Dec. 21 from complications related to cancer and dementia. He was born in Philadelphia, the oldest of three sons of Joseph W. and Anna Mary (Subach) Upcavage, and raised in Shenandoah, Pa. (Schuylkill County), where he attended elementary and high school. In 1952 he earned a Bachelor of Science degree in clinical psychology from Penn State University. He went on to work as an information systems manager for Honeywell, Inc. before his retirement. He and his Anna (nee Tomko) were married for 61 years. They had three children: Richard, Joseph, and Theresa; 10 grandchildren; and four great-grandchildren. Deacon Upcavage was ordained a permanent deacon on June 2, 1996 at the Cathedral Basilica of SS. Peter and Paul by Cardinal Anthony Bevilacqua and assigned to Queen of the Universe Parish, Levittown, where he remained until his retirement in 2010. Deacon Upcavage was also a member of the Secular Franciscan Order. The funeral Mass was celebrated Dec. 28 at Queen of the Universe Parish, Levittown by Father John C. Moloney, with Father Robert A. Pesarchick concelebrating. Interment was at St. Stephen’s Slovak Catholic Cemetery, Shenandoah Heights. Deacon Upcavage is survived by his wife, children, grandchildren and great-grandchildren. He was predeceased by two younger brothers.